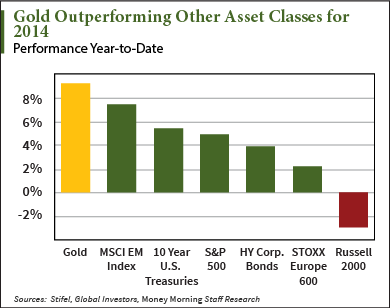 Gold investing 2014 update: Gold prices have had a strong first half in 2014. At the midpoint in July, the yellow metal had gone up 9.2% in value. That rise has led gold to be the best performer among major asset classes this year, gaining more than U.S. Treasuries and equities. According to The Short Side of Long research, in 2014's first quartergold returned over 13% for the rolling three-month period. In comparison, alternative asset classes U.S. equities, U.S. Treasury Long Bond, and GEM equities only returned 0%, 6%, and -7% in the same period. "Gold looks set to head higher," Krauth said last week. "Gold's 50-day moving average recently pushed above the 200-day moving average, completing what's known in technical analysis as a bullish golden cross." Krauth's referencing a crossover of gold's short-term moving average breaking above its long-term moving average, or "resistance level." The golden cross is indicative of an impending bull market, and the effect is reinforced by high trading volumes. "Gold is trading around $1,300 which seems to be providing support. Both the 50-day and 200-day moving average prices have acted as a magnet in the gold price forming a bottom," said Krauth. Krauth also pointed to another bullish signal for gold prices the remainder of the year – he said gold's on an uptick after completing a drawn-out head and shoulders cycle that began in July 2013. "The next target for gold is around the $1,380 level, which it touched but reversed from in mid-March. If it can close above that level and sustain it, the next target will be $1,425 followed by $1,475, and finally around $1,600, a level it may reach late this year or early next."